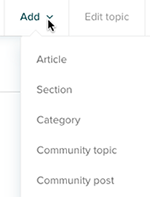 You can organize your knowledge base content into categories and sections and manage the order of those categories and sections. You must be a Guide Manager to add and edit sections and categories. For more information, see About the Help Center knowledge base structure. In Help Center or Guide Admin, click Add in the top menu bar, then select Category. Enter a Name and optional Description for your category. (Guide Enterprise) In the sidebar, if you have multiple category templates in your live theme, click the Template menu, then select a template. If you do not select an alternate template, the default category template will be applied. In the sidebar, ensure the correct Source language is selected. The category is created. Remember, if you have only one category, then the category itself is hidden to end-users, and they see only the sections that are in your Help Center. Tip: For information about how you can display a section in multiple categories, see Displaying an article or section in multiple sections or categories in our Support tech notes. Sections are collections of related articles. To add a section, you must have at least one category to act as its parent container. On Guide Lite and Professional, each section must be child of a category. On Guide Enterprise, a section can be a child of a category or a section. 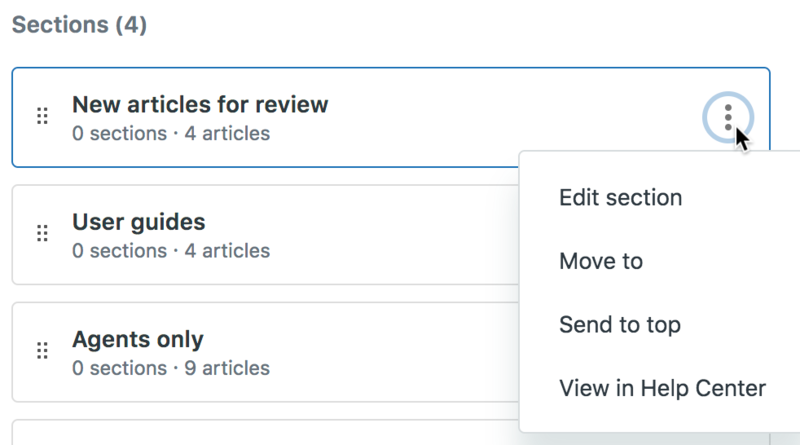 Permissions for viewing and managing articles in a section are set at the article level, not the section level. If visibility for all the articles in a section is internal (Professional and Enterprise only), then the section will not be visible to end-users, but if one article in an internal section is visible to any end-users, then the section will become visible as well. In Help Center or Guide Admin, click Add in the top menu bar, then select Section. (Guide Professional and Enterprise) Ensure the correct Source language is selected if you support multiple languages. Under Order articles by, select an option for how you'd like articles to appear in this section. If you select to manually order of articles, see Manually changing the order of articles to change the order of your articles. Under Hierarchy, click in the field, then select where you'd like this section to appear in your Help Center. On Guide Lite and Professional, you must select a category as the parent for this section. Sections cannot contain sections. On Guide Enterprise, you can select a category or a section as the parent for this section. You can nest sections in sections for a maximum of five section levels, with up to 20 sections in a section. 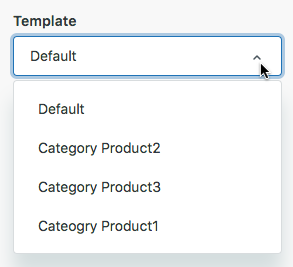 (Guide Enterprise) If you have multiple section templates in your live theme, click the Template menu, then select a template. If you do not select an alternate template, the default section template will be applied. The section is created. Remember, if you have only one category, then the category itself is hidden to end-users, and users see only the sections that are in your Help Center. You can change the properties of a category or section, including its title or description. In Help Center, navigate to the category or section you want to edit, then click Edit section in the top menu bar. In Guide Admin, click the Arrange content ( ) icon in the sidebar and drill down to the category or section you want to edit. Click the options menu at the end of the section title, then select Edit category or Edit section. When you delete a category, all the sections contained in the category are also deleted, and all the articles contained the sections are archived. When you delete a section, all the articles contained in the section are archived. In Help Center, navigate to the category or section you want to delete, then click Edit section in the top menu bar. In Guide Admin, click the Arrange content ( ) icon in the sidebar and drill down to the category or section you want to delete. Click the options menu at the end of the section title, then select Edit category or Edit section. Click Delete in the bottom of the sidebar. Confirm that you want to delete the category or section. You cannot recover deleted categories or sections. Any articles contained in a deleted section are archived. You can restore archived articles to another section if you need to. Alternatively, to delete a category or section, you can click Articles > Arrange articles, then click the name of the category or section you want to delete (you'll have to expand a category to see its sections). In the edit page, click Delete in the bottom of the sidebar. If the edit page doesn't open when you click the name of the category or section from Arrange Articles, it is likely being blocked by a pop-up blocker. 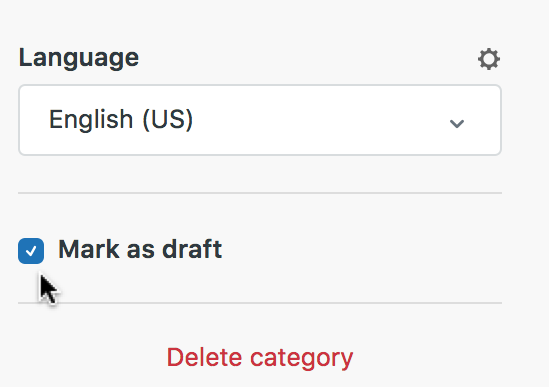 If you create a category or section that is a work in progress, and want to restrict who can access it, you can mark it as a draft. Marking a category or section as a draft applies the draft status to any elements within it. The steps for marking a newly-created category or section as a draft are slightly different than those for marking an existing category as a draft. Create and save a new section or category, as described in Adding a category to your knowledge base or Adding a section to your knowledge base. The section or category is created and remains open for editing. Click the Mark as draft option in the sidebar. Open the category or section in edit mode, as described in Editing categories and sections. Categories and sections marked as drafts are not viewable by end-users, and can only be accessed by Guide Managers. When the category is published, the section is no longer in draft mode, and the banner is removed. However, if the section is manually marked as draft, it will remain in draft mode until the marker is removed. If I restrict a section to be viewed only by Agents and Managers, does that also mean any published articles within that section are also only viewed by agents and managers? Basically, I want to start adding articles for a new beta design we're rolling out next week, so that when we do roll it out, I can just publish the section and all the articles are then subsequently published (rather than going through multiple draft articles one-by-one and undrafting them). Is that how this works? Speaking of restricting access to particular sections, a question has popped into my head. We presently have our Help Center rolled out for several spanish speaking countries. Mexico, Panamá, Ecuador and the like. How do I keep an open Help Center and yet have sections divided up by country or region? Is there a way for Zendesk's Help Center to detect anonymous users and tag their ip or region? I understand that it would be a lot easier to set it up by hiding the sections or articles behind a "must log in" and then a "must have X tag" to do this thing. But is there a way to do it so that straight up strangers can land in their regional/national version of our Help Center. I was thinking of dipping my toes in multibranding, but cloning a whole help center to modify a few articles here and there sounds like overkill (unless there's a super easy way to do it I'm not aware of). Plus, if I'm not mistaken, multibranding works with organizations and groups to create a "brand", but this doesn't solve my problem of the complete stranger wondering into my help center for the very first time, does it? I see instructions for moving an article from one Section to another Section, but I need to move an article from one Category into another Category. How can I do this? You should be able to drag the article into the appropriate Section in the Category where you want it to reside. You just need to expand the target Category and Section before you drag the article to it. I didn't realize you could expand multiple categories simultaneously! I should have checked that - my fault. Thanks! With reference to the image below, will ALL 'Agents and managers' be able to view articles (because they can manage them), or will the group filter also apply to the 'manage' option? I was able to conduct a test and confirm that when the Operations tag is applied, if the agent has managing permissions the section & articles will be visible. If the agent has Help Center viewer rights, they will not see the content if they are not a member of the Operations group. Feel free to check out this article which discusses more about the Help Center roles & permissions. If it indeed isn't a feature, does it exist as an item in your product roadmap? Alternatively, how can I submit a proper feature request to influence it? That's correct, it's not possible to display articles that way out of the box. You may be able to achieve it through custom design code, though...hopefully some of the coding gurus here in the community will be able to help you with that! I just recently switched to the Copenhagen theme and I no longer see the ability to delete articles when editing them. Has this been replaced by "archive article"? Please advise. Thanks. Is it possible to get metrics on knowledge base sections or categories? I know I can see the number of views an article has, but I'd love to see what sections are getting clicked into the most. My articles order doesn't affect how it's displayed in the mobile app (default help centre category presentation). Is there some sdk setting I'm missing or it's just not supported? I have the same question as Vladimir above with the SDK. We'd like to add a category for system status updated but it always appears at the bottom. Can't figure out how to make it appear on top. I am adding a new section to a category. When I add the Section it is not appearing in the Category, but is not there when I go to arrange the content. Has anyone successfully done something like this? The reason we are trying to do something like this in our help center is there are now way to many sections (and growing) so it is getting increasingly harder to scroll through and find what they are looking for. Even with the smart search, it's not ideal for those looking to browse. We also don't want to have many more additional categories on the main page of our help center like many other help centers have. Our help center page is a big place for training articles/videos and want to make it as easy to navigate as possible. For example, here's how we would want our help center to look. i some how managed to hide a category from people when not signed in... how do i change it back? If all the sections within a Category are hidden will that make the Category hidden? I would like to have an internal and external KB running, our internal is already built out with many Categories for the different team that use ZD. I don't want my customers seeing those Categories as empty options for them. Was anyone able to answer Bob's question? Is it possible to display an article in two diffrent sections wtihout creating and editing two similar articles? It would be nice, if you could mark an article to be shown in two different sections. There isn't any native functionality that allows this right now, but we do have a Tip that details how you can make it happen with some custom code. If that level of customization won't work for you, I'd encourage you to head over to our Product Feedback forum and add your vote and detailed use case to the thread about this functionality. This is really helpful to our Product Managers as they evaluate what improvements to make to the product (even though they can't always answer). Typo: `mange` instead of `manage` in the first paragraph. Oops! Good catch. It's fixed now. Thanks for letting us know, Amin!